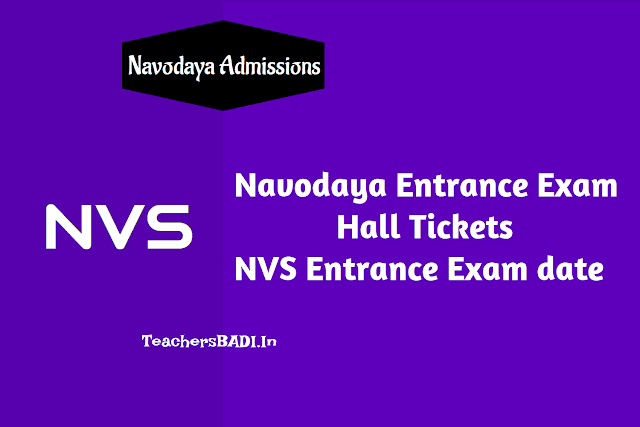 NVS Navodaya Entrance Exam date, JNV Selection Test Admit cards / JNVST 6/9th Class Entrance Exam HallTicket 2019 Download, Navodaya Vidyalya Exam 2019 Hall Tickets, Navodaya Vidyalaya Exam 2019 Admit Card, Jawahar Navodaya Vidyalaya Selection Test 2019 Admit Card, JNVST 2019 Hall Ticket Download, NVS Hall tickets, Navodaya hall tickets, Navodaya entrance exam date details are provided here. The Navodaya Vidyalaya Class 6 entrance exam will be conducted on April 6, 2019. The candidates who have registered for the JNVST entrance exam can download the admit card from the official website of the Navodaya Vidyalaya. To download the JNVST 2019 admit card, the candidates need to enter their Registration No. and Password allotted during registration. * జవహర్‌ నవోదయలో 6వ తరగతిలో ప్రవేశానికి ఏప్రిల్‌ 6న ఉదయం 11.30 గంటల నుంచి మధ్యాహ్నం 1.30 గంట వరకు ప్రవేశపరీక్ష నిర్వహిస్తున్నారు. * పరీక్ష కేంద్రాలకు ఉదయం 10.30 గంటల్లోగా హాజరు కావాలి. విద్యార్థులు హాల్‌ టిక్కెట్లను ఆన్‌లైన్‌ నుంచి డౌన్‌లోడ్‌ చేసుకుని పొందాలి. * పరీక్ష 100 మార్కులకు ఉంటుంది. * మెంటల్‌ ఎబిలిటీ టెస్టు 50, అర్థమేటిక్‌ 25, లాంగ్వేజ్‌ టెస్టు 25 మార్కులకు ఉంటాయి. * హాల్‌ టిక్కెట్లు డౌన్‌లోడ్‌లో ఏదైనా ఇబ్బందులు ఎదురైతే నవోదయలోని హెల్ప్‌ డెస్క్‌ను సంప్రదించాలి. Navodaya 6th class entrance exam date, Admit Cards /Hall tickets 2019 download: Jawahar Navodaya Vidyalaya Selection Test-2019 in respect of the Phase I Summer, Winter and Extreme winter bound Jawahar Navodaya Vidyalayas will be conducted on 06-04-2019. Arrangement will be made to download the admit cards by the candidates from the website of NVS https://www.nvsadmissionclasssix.in/nvs6reg/homepage. Candidates may contact Principal of JNV concerned and collect Admit Cards, in case of difficulty. JNV entrance Exam 2019 download admit card (JNVS 2019): The admit card for the Jawahar Navodaya Vidyalaya Selection Test 2019 (summer, winter and extreme winter bound JNVs) would be released on the official website https://www.nvsadmissionclasssix.in/nvs6reg/homepage. All those candidates who had registered for the same are required to download their respective cards from the website itself. Those who have registered for the test through online mode may download the same by the Official website. The exam is scheduled to be conducted on 06-04-2019. The exam is held for admission into various Jawahar Navodaya Vidyalayas (JNV). The languages in which the exam will be conducted included in English, Garo, Hindi, Urdu, Bengali, Punjabi, Sindhi (Arabic), Tamil, Telugu, Nepali, Oriya, Marathi, Assamese, Bodo, Gujarati, Kannada, Khasi, Malayalam, Manipuri, Mizo, Sindhi (Devnagari). Candidates must keep their hall ticket while you are going to the examination hall and must read and follow the instruction given on the Hall Ticket. Candidate should preserve this "Hall Ticket" for any further future correspondence. Candidates are advised to visit the exam centre one or two days in advance to know the location of the centre and transportation facilities available to reach the on time to avoid tension and confusion. Nearly 5 lakh more students have registered for admission to #NavodayaVidyalayas this year due to introduction of simplified one-page application form & online registration system, transforming education. As many as 27 lakh aspirants have registered for Navodaya Vidyalayas admission test for VI standard to be conducted for Aacademic Year 2019-20 as compared to 22.5 lakh last year. This reflects the growing quest for Quality Education in rural India. Navodaya Vidyalayas have around 45000 seats in 623 schools spread over 601 districts across States. #NavodayaVidyalayas provide free #QualityEducation with Boarding & Lodging for students from rural India. #NavodayaVidyalayas students have been making impressive performance in various competitive exams like IIT-JEE, NEET, etc. #NavodayaVidyalayas have also produced alumnis in almost all fields, including Civil Servants, Engineers, Doctors, CAs, Entrepreneurs, etc. The aim of Navodaya is to provide all round quality education to talented children from rural areas and ensure that students obtain a competency in three languages. It also promotes national integration through its course and serves as a focal point of quality education in each district of the country. The result of JNV Selection Test 2019 is expected to be announced by end of May. The result will be displayed in the offices of Jawahar Navodaya Vidyalayas, District Education Officer and the District Collector's offices too. The Principal of JNV will also inform the selected candidates through registered post. The two-hour test will have 100 objective type questions in three sections. In the test that will be marked for 100 marks, mental ability will be marked for 50 while 25 marks each will be awarded to language skills and arithmetic. In the State of Andhra Pradesh, Telangana, Assam, Bihar, West Bengal (except Darjeeling) Chhattisgarh, Goa, Gujarat, Haryana, Himachal Pradesh (except Chamba, Kinnaur, Mandi, Sirmour, Kullu, Lahaul & Spiti and Shimla Districts), Jharkhand, Kerala, Karnataka, Madhya Pradesh, Maharashtra, Manipur, Orissa, Punjab, Rajasthan, Tripura, Telangana, Uttar Pradesh, Uttarakhand, Delhi, Arunachal Pradesh (except Tawang District), Union Territories of Andaman & Nicobar Islands, Chandigarh, Dadar & Nagar Haveli, Daman & Diu, Lakshadweep and Pondicherry . In the States of Meghalaya, Mizoram, Nagaland, Sikkim ,Jammu and Kashmir (except Leh & Kargil) and in the District of Tawang of Arunachal Pradesh, in the Districts of Chamba, Sirmour, Kullu, Kinnaur, Mandi, Shimla of Himachal Pradesh, in the District of Darjeeling of West Bengal. In the Districts of Leh, Kargil of J&K State and in the District of Lahaul & Spiti of Himachal Pradesh State.